with our commitment to EXCELLENCE, you can plan your event with confidence! 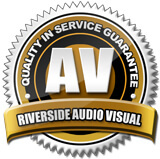 We work hard continually learning, growing, reading, and training in order to provide you with the best audio visual experience for your event. From maintaining, upgrading, and customizing the equipment to running research and development sessions to ensure that you get the best each event!